Last week there was a lone visitor at the irrigated pastures of the UC Hopland Research & Extension Center. 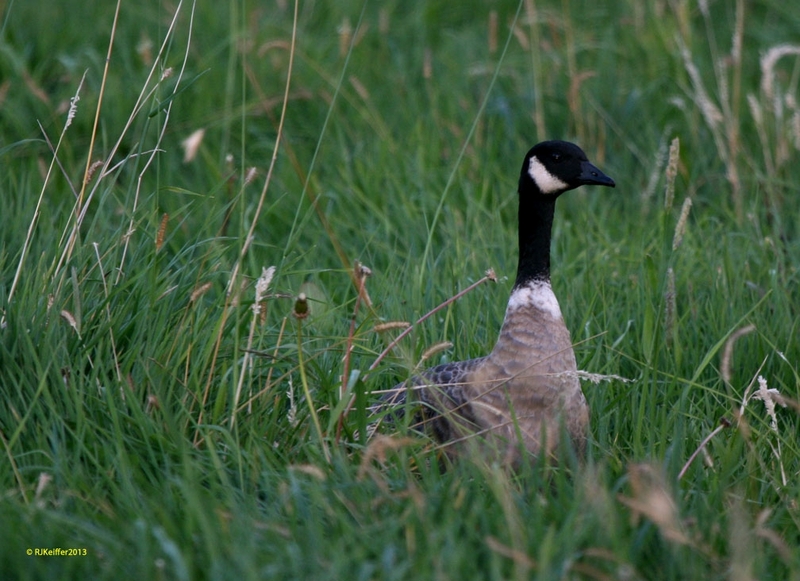 It was an Aleutian Cackling Goose (Branta hutchinsii leucopeia), formerly known as the Aleutian Canada Goose. The namesake of this species comes from their breeding range on the Aleutian Islands between the Pacific and Bering Seas. When Danish-born explorer and ship captain Vitus Bering led two Russian ships to the east of Russia and discovered the rich fur-bearing resources of the west coast of North America it resulted in an uncontrolled "fur-rush" of trappers to exploit the resources. By 1750 Arctic foxes and red foxes were being transplanted to most of the Aleutian Islands, a technique that continued throughout the 1800s. The foxes decimated much of the other wildlife on the islands, including nesting geese. The Bering Cackling Goose was exterminated and extinct by 1914. The Aleutian Cackling Goose was thought also to be extinct until a small remnant population was discovered on Buldir Island in 1962, when only a few hundred birds remained. The subspecies was declared federally endangered in 1967, with a recovery plan developed to remove foxes from historical breeding islands, re-introduce wild geese to those "new" islands, and protect the winter habitat in California. ...a HUGE success story, as the population had surpassed 100,000 birds by 2007. Now many of the wintering birds that arrive in California in mid-October end up wintering in the North Coast, although most still winter in Central Valley of California.